Amazon | Why has median income stopped rising in the US? Why is the share of population that is working falling so rapidly? Why are our economy and society are becoming more unequal? A popular explanation right now is that the root cause underlying these symptoms is technological stagnation — a slowdown in the kinds of ideas and inventions that bring progress and prosperity. In Race Against the Machine, MIT’s Erik Brynjolfsson and Andrew McAfee present a very different explanation. Drawing on research by their team at the Center for Digital Business, they show that there’s been no stagnation in technology — in fact, the digital revolution is accelerating. Recent advances are the stuff of science fiction: computers now drive cars in traffic, translate between human languages effectively, and beat the best human Jeopardy! players. 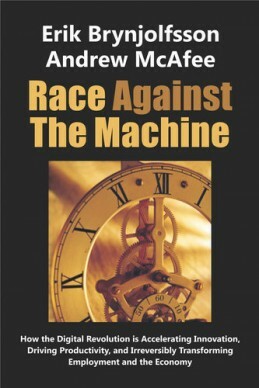 In Race Against the Machine, Brynjolfsson and McAfee bring together a range of statistics, examples, and arguments to show that technological progress is accelerating, and that this trend has deep consequences for skills, wages, and jobs. The book makes the case that employment prospects are grim for many today not because there’s been technology has stagnated, but instead because we humans and our organizations aren’t keeping up.